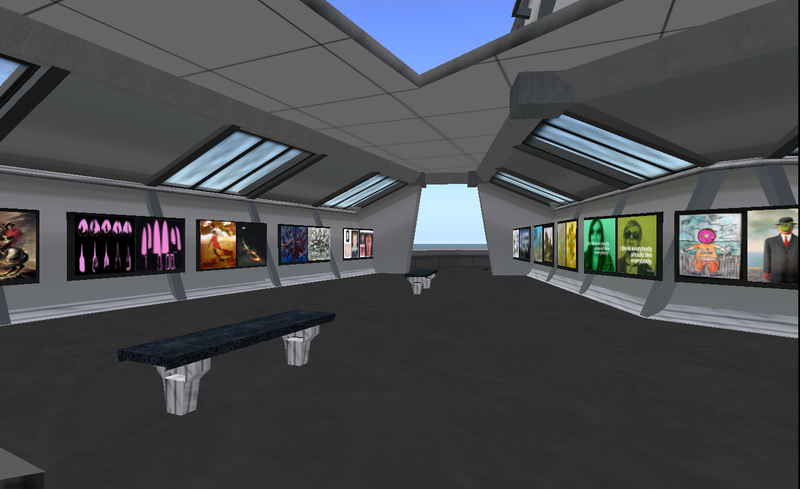 “Second Death”, the MFA exhibit of graduate student Kuang Chen Hsu, is now open to the public on the Bowling Green State University Virtual Campus in Second Life. The exhibit is an exploration of the experience of death in various cultures and religions, and is an interactive, educational setting where the users can walk their avatars through the different ceremonies and traditions. It also examines the impermanence of life in contrast with the fundamentally indestructible nature of the virtual world. “In Second Life, everyone can have another life, and it is an eternal life without dying,” states the introductory sign at the front of the exhibit. “Second Death” offers a new perspective and experience for Second Life users. Kuang recently gave a presentation of his exhibit at the Pop Culture Association Conference in St. Louis, and his work will also be featured in the MFA Thesis Exhibition at the School of Art from April 10th to the 20th. The MFA exhibition will have an opening reception at the BGSU School or Art in the Dorthy Uber Bryan Gallery from 7-9pm on April 9th. December 4th marks the sixth annual ArtsX at the Fine Arts Center, and the Second Life staff has some exciting events lined up for the evening! Swing by room 1102 between 6-10 PM and see a Fashion Show (6:30), play our “Mondrian Madness” game (7:30), and participate in our Ava-Art Show (8:30). We hope to see you there! A reminder to all digital arts and computer graphics aficionados out there! 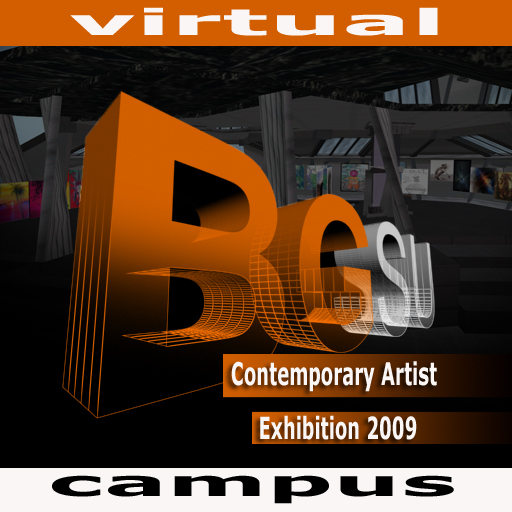 This year’s SIGGRAPH SpaceTime Exhibition is currently being hosted in Second Life on the BGSU Virtual Campus. 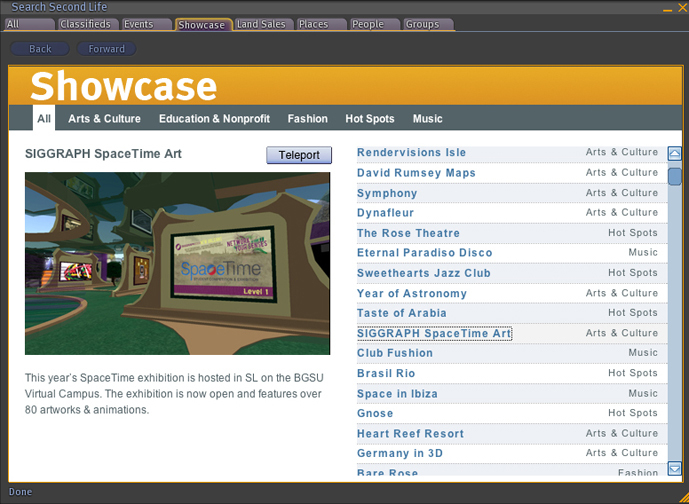 It can now be accessed via the Showcase tab (pictured below). For more information about the SIGGRAPH Exhibition itself, see our older blog post. Also, the Exhibition Catalog can be downloaded here, the third link down (the Catalog without the Annual Report). It also includes a short introduction by our own Dena Elisabeth Eber (Associate Professor and Chair, Digital Arts). This exhibition includes two floors of artwork. The first floor hosts work created by Art 101 students influenced by works from history. The full assignment sheet can be seen here. Each work is presented next to the work that inspired it. 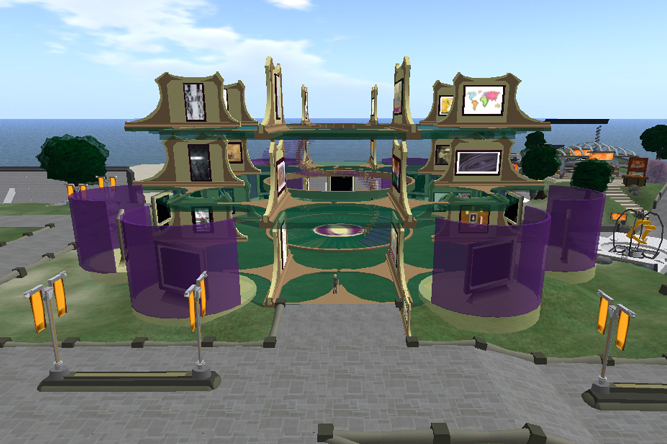 You can read more about what inspired the students by clicking on each of the works in Second Life. 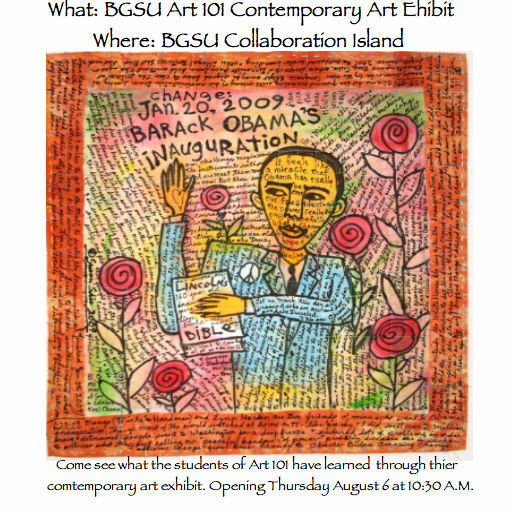 The exhibition also includes a show of artwork by practicing artists curated by Art 101 students. The assignment sheet for this show can be seen here. Each student interviewed the artist about their work. 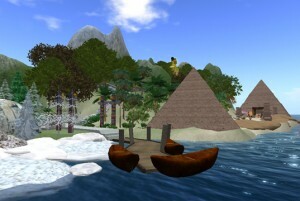 The interview can be read by clicking on each work in Second Life. Below are a few of the “Extra Credit” postcards and posters made for the exhibition.